Finally, my first bra test! After gearing up for my bra quest, finding my size, testing some department store bralettes, and picking my patterns, I made up my first muslin! This is the vintage 1940s reproduction from Mrs Depew, which I chose because of its vertically seamed cups and similarity to some of the bralettes I have been coveting online. Here's a close-up of the seams. The whole thing does look very neat and tidy, if I do say so myself! Because I do have some practice making bathing suits, the whole thing came together in just a few hours, and is actually very comfortable. The fabric is an interlock knit, which gives it some softness and stretch yet is still firm enough to hold everything in place. However, what it has in comfort it's missing in shape. While it's surprisingly not bad for my first attempt (there's no pulling or tugging), it fits more like a sports bra and doesn't provide much lift or curve. In fact, it has much more of a flattening effect on me. Part of this is due to the fit - the bridge does not lay flat on my chest as it should, and believe it or not I think I need a little more curvature in the cups. The pattern says it's multi-sized, yet only has adjustment lines for the length of the back of band, so it is definitely an A/B-cup pattern and I wouldn't recommend it for a larger gal. 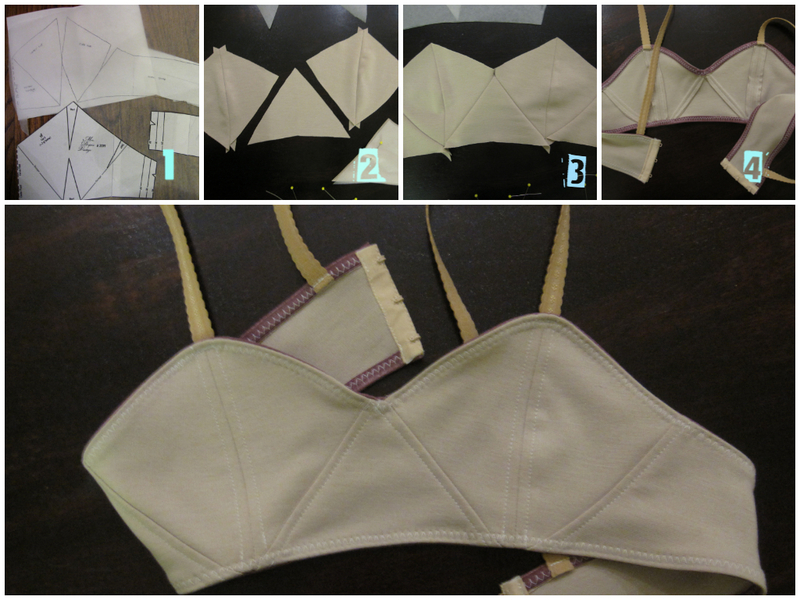 My next bra muslin will be traced off of a ready-to wear bra, so we'll see how that fit turns out next week! I've also started looking at fabric for making up the final bra, and am loving Summerset's bra kits, which seem like an affordable way to get something nice. Be back with more next week! Such a pretty, vintage look! It sounds like a good at-home option. I've been eyeing this pattern. I actually just made a bra that has a similar style from Merckwaerdigh (BHS10, view A) and I found that it's very comfy but provides almost no shape, like you say with the vintage bra. I've bought several of Summerset's kits. She includes a really good amount of powernet... you can use it for multiple bras! I've worn and washed multiple times the bras I've made with her kits and they are all holding up nicely. Kathy - I took a look at your bra and it is very cute! Love the sheer lace part. Too bad about the shape thing because these types of bras are often so adorable! Good luck on your bra quest :) I've yet to go on one but I see it in my future once schools done because I absolutely love the bras VeryPurplePerson makes and would love to do the same. I just wanted to let you know that I've nominated you for a Liebster award: http://threadtheoryblog.wordpress.com/2013/03/22/liebster-award/. I realize these awards aren't everybody's thing so don't feel obligated to pass it on or reply...I just wanted to let you know that I really admire your blog and enjoy reading your posts! This is great! Very brave of you to take on bras. Looks very professional. Good luck! Hey Rebecca - good question! I didn't eliminate the darts but rather converted them to a seam, so the curve of the pattern piece is still there (you can kind of see it in the first construction picture). I do, however, lack some drafting skills, so I think I may have accidentally reduced the volume a little bit by not adding a seam allowance in the center (where this is no dart). Live and learn! Hi there! I've nominated you for a Liebster Blog Award! What is it? In a nutshell, it is basically a blogger's way of saying "You're one of my favorites! Great job." This is really great for a muslin! It looks like a keep to me, well done! And thanks so much for linking to my pattern!